Baseball is a team sport, but every play begins with a pitch. The pitcher has more direct influence on the entire game than any other position, which is why baseball statistics assign wins and losses to pitchers, not to shortstops or right fielders. It’s also why pitching can be one of the most high-pressure roles in pro sports. All nine players take their turns trying to score runs, but it’s primarily the pitcher’s job to keep the other team’s batters from getting on base. Managers are evaluated, criticized, and even fired over the decisions they make about when to pull a tired pitcher out of a game and who should replace him. 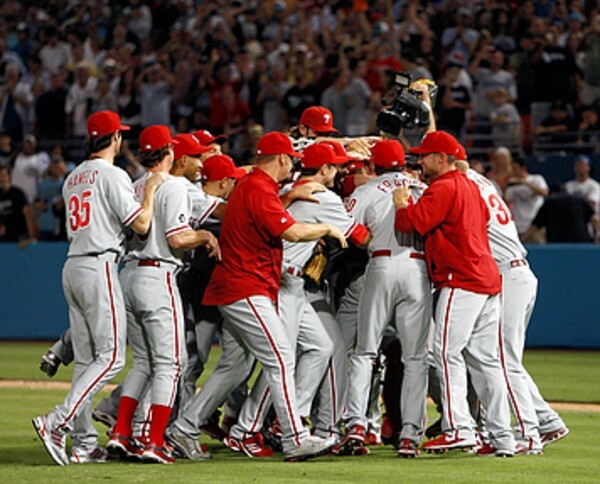 The Phillies celebrate after Roy Halladay completes the 20th perfect game in major league history. The best possible outcome for a pitcher is a perfect game, a game in which not even one opposing batter is allowed to reach base. This is harder to do than pitching a no-hitter, because there are several ways for a batter to get on base without getting a hit. Nine innings, three outs in each– 27 opposing batters will come to the plate in a perfect game. The pitcher can’t allow a single hit. There must be no fielding errors (bad throws or misplayed balls) that allow a runner to reach base. The pitcher must not hit a single batter with a pitch, and– perhaps hardest of all– he must not walk a single batter. In 27 consecutive at-bats, the only acceptable outcomes are a strikeout, a ball caught in the air by a fielder, or a ball scooped up and thrown to first base before the batter can make it there. A perfect game is certainly a testament to the pitcher’s skill, but it also requires a lot of luck– many of the things that need to happen for a perfect game to take place are outside of the pitcher’s control. The outfielders need to anticipate where the ball is likely to be hit and be in the right place to catch it. The infielders need to have quick reflexes and be on target with their throws. The umpire needs to have a perfect game as well. Needless to say, recording a perfect game is a huge accomplishment. In the 135-year history of major league baseball, there have been only 20 perfect games. The Pittsburgh Pirates have been around for most of that time, but the Pirates have never had a perfect game. They just had a game that was even better. For most sports fans, the Pittsburgh Pirates have become synonymous with losing baseball. They are currently working on their 18th consecutive season of losing more games than they have won, and there’s no indication that streak won’t continue. I was 12 years old the last time they were good. But I’ll still always be a Pirates fan. How could I not be? I’ve cheered the Steelers and Penguins on as they won championships for Pittsburgh, which is more than some die-hard sports fans get to see. What kind of fan would I be if I gave up on the Pirates? Historically, the Pirates have a lot of great moments to look back on. They are one of the National League’s oldest teams, and they own 5 World Series championships. And they’ve done some things that no other major league team has done. One of the things that gives the sport of baseball its charm is its eclectic set of statistics. The stats for football are measured in familiar terms like yards and seconds. But baseball is a weird game; it has its own language with things like at-bats, earned runs, and 4-6-3 double plays. In the oddest cases, the statistics become more important than the game itself (something that I don’t always agree with). A batter purposely stops at first base in order to record a single because he already has a double, triple, and home run. A crowd stays breathlessly to the end of a game that is not even close because the pitcher has a chance to record a perfect game. It’s all because of the chance to see or do something so rare that you can list all of the players who have done it on one page. I sometimes think my Asperger’s may have something to do with my enjoyment of watching and reading about games to see the patterns that emerge– no two games exactly alike, but some beautiful in their uniqueness. It’s like throwing a handful of sand into the air to see the patterns that emerge as it spreads in the wind. But I think it’s probably a human thing to find enjoyment and comfort in watching for patterns. Anyway, the Pittsburgh Pirates have their share of unique history. Within the space of 5 years, three players on the Pirates each accomplished a different feat that has been done only once– it had never happened before and has not happened since, even with all of the hundreds of major league baseball games played each year. Let’s begin with a question: What is the most impressive outcome possible for a batter in a single time at bat? This hymn has been a comfort to me whenever I have been struggling with doubt and need to be reminded of God’s promises. The wonderful thing about it is that for most of the hymn, the “speaker” is not you– it is actually God! Do you ever feel uncertain of your own faith in God, or unsure of whether you love him? Even if you do, you can still sing this song at the top of your lungs, because it’s about God’s love for his people, not their love for him. And that never changes and is never in doubt. to you who for refuge to Jesus hath fled? This song helps me to stop thinking about myself and picture things from God’s point of view.